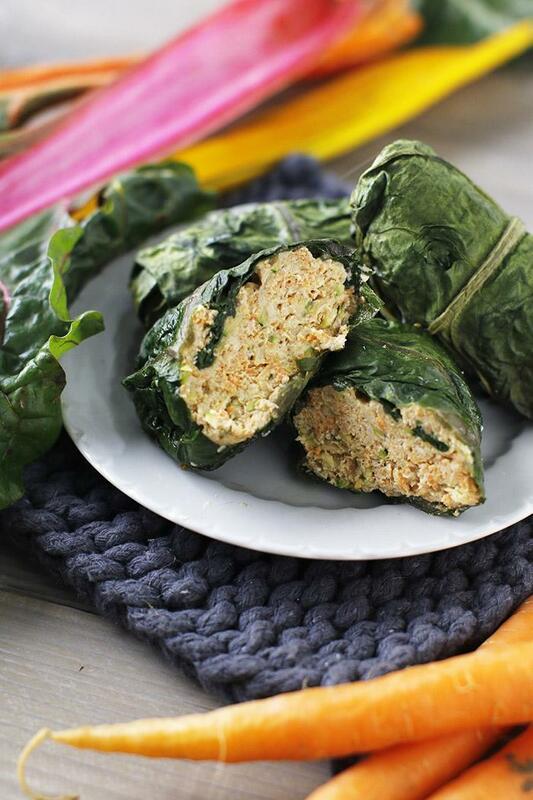 Turkey roll-ups wrapped in chard leaves and stuffed with shredded carrots, zucchini and seasoned with Asian flavors! Then served with a creamy avocado dipping sauce. 1Preheat the oven to 355º. Oil medium baking dish with olive oil. 2Dice the carrots and zucchini. Sautee carrots and zucchini for a couple minutes until tender. Cool and squeeze the water out of the veggies with a cheese cloth or paper towels and set aside. Grate ginger and set aside. 3**Blanch leaves (optional): If using swiss chard or stiff/sturdy leaves, boil water and turn down to medium heat. Place leaves in water for 15-30 seconds until softened, but still bright green. Dunk in ice water, dry off and set aside. 4Mix turkey and roll up: Mix turkey with all ingredients listed under "Chard Rolls". Slice around the chard stems in an upside-down "v", 1/3 up the stem. Mold 2-4 spoonfuls of meat and place above the cut "v". Fold chard "wings" over meat and tuck in the sides as you roll up. 5Cook rolls: arrange rolls, loose ends down, in oiled baking dish. Drizzle with olive oil and sprinkle with salt. Bake for 25-30 minutes. 6Make sauce: Mash avocado and mix in next 4 ingredients. *The number of chard leaves depends on how large they are. The bigger they are, the more filling you can use! *For an egg-free option, leave out the egg.